Devoid Of Culture And Indifferent To The Arts: Lillies. Work now. Enjoy later. Lillies. Work now. Enjoy later. Lillium supurbum (Turk's cap lilies), a few years go. Yesterday was the first time all year I spent any real time playing in the ground. I did it because I had to. I purchased some lilies from Canadian Tire on Friday. 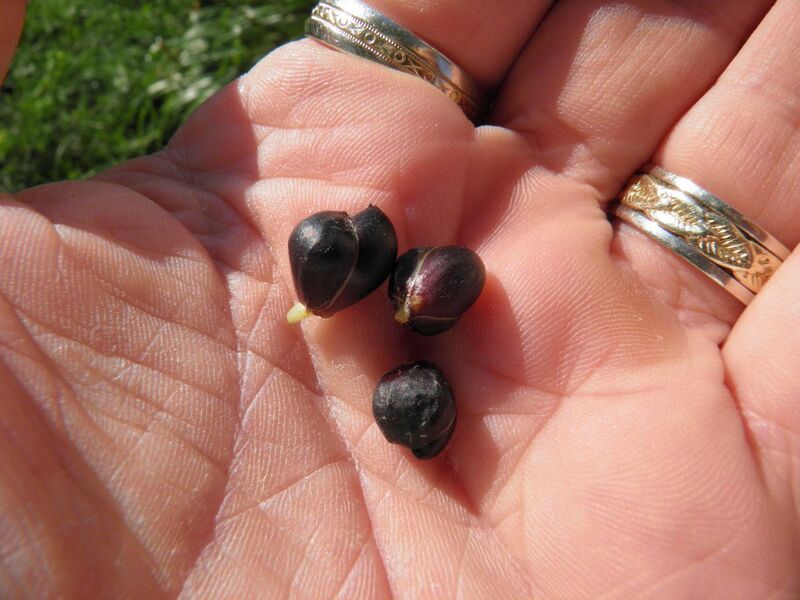 Now is the time to stick them in the ground, without delay. 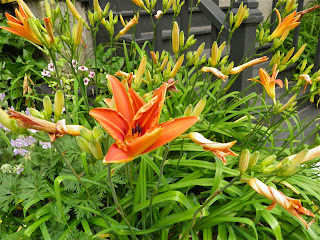 Our current lilies from previous years are bursting out of the ground at a rapid rate. Day lilies at the old house in Halifax. What kind of lilies you may ask. That can be a complicated question. Common name and real names sometimes don’t mean the same thing. We have two main types of “lilies” in Nova Scotia: day lilies, and then the rest – true lilies. They’re easy to tell apart. 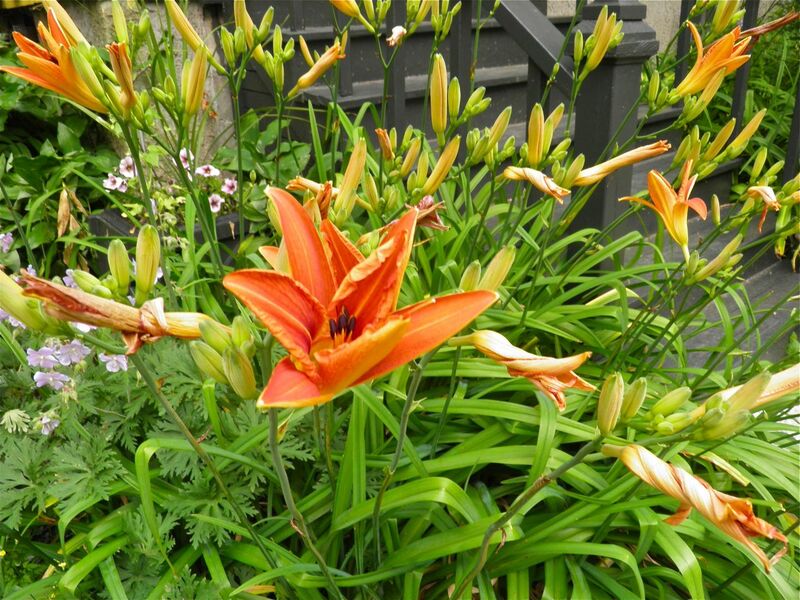 Day lilies, as the name suggests, have blooms that last only one day before withering. The stems contain many buds that mature, one after another, giving constant bloom for up to a couple weeks in very late spring/early summer. They have strap-like leaves and the blooms are at the end of leafless stocks. Day lilies are not real lilies. Their proper name is hemerocallis. It comes from the combination of the Greek words for “day” and “beautiful.” They grow from rhizomes close to the surface of the ground. It doesn’t take long for a large mass to form if they’re in a happy spot. Day lilies are divided into two main types: diploid (the old fashioned spindly ones) and tetraploid (the big flowered sturdy ones). Tetraploids have had their chromosomes increased. Both varieties come in re-blooming varieties, which is a good thing to look for. Hemerocallis seem to come and go far too quickly. year there's just one leaf. Give them time. “True” lilies (lilium) grow from a bulb composed of “scales.” The bulbs can be quite large on mature plants. They most commonly reproduce by the bulb naturally dividing. So the year after you have a fantastic tall lily you may have two sad, spindly ones. Never fear. If in a good spot they’ll come back strong. Lillium have leaves that appear along the stem and they can grow to quite impressive height. For a few years in Halifax we had a “Scheherazade” that grew to well over six feet with approaching 20 flowers. Stunning. It was an “Orienpet” type – a cross. True lilies come in several different forms: Asiatics, Martagons, Candidiums, Longiflorum, Trumpet, Orientals, and species (plus a few others). Each has a different looking flower and height, but all come from that scaly bulb. Orienpet is a cross between Oriental and Trumpet. Most true lilies are highly fragrant. Many lilies have multiple ways to reproduce. 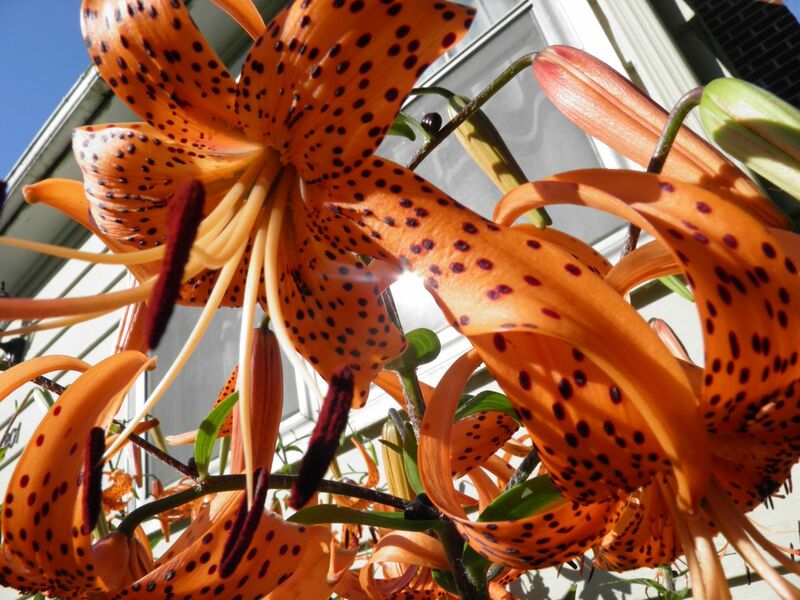 For example, they can divide underground, produce seed from the flowers, and then (especially in tiger lilies) also grow odd little bulbs where the leaves meet the stalk. Plant them and in a few years you will have many, many more lilies. Here’s an interesting fact. Even with all the breeding, no blue lilies have ever been produced. A small section of the day lilies we have across the front of our property. Lilies of all kinds are in full force now in pots at garden centres and as bare root bulbs even in grocery stores. Most day lilies are sold in pots, so all you do is take them home and plant. They’re not cheap. Never buy a day lily that hasn’t poked through its ground by now. There will be tears before bedtime if you do. If buying lillium “bare root,” only buy bags that feel like they have some weight to them. Light bags mean the bulbs may be withered and/or dead. 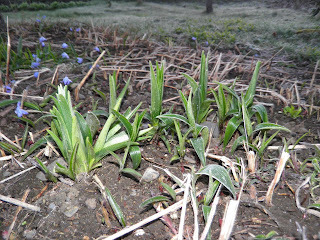 This clump of day lilies is in desperate need of division. Lillium in bags with wood shavings are quite affordable. I paid $6.69 for 5 bulbs per bag of some very nice Oriental hybrids. I got two bags. I may buy more. The longer those bulbs stay in the bag the more chance you run of them drying out so plant as soon as you’re able. Our other lilies are up several inches already, and the new bulbs had stalk growth emerging. 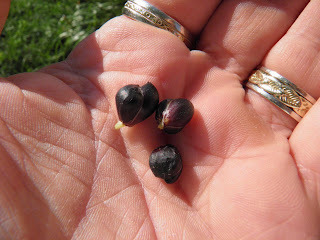 When planting, put lillium bulbs at least a few inches under the ground, but don’t worry too, too much about how deep. A few inches is good. 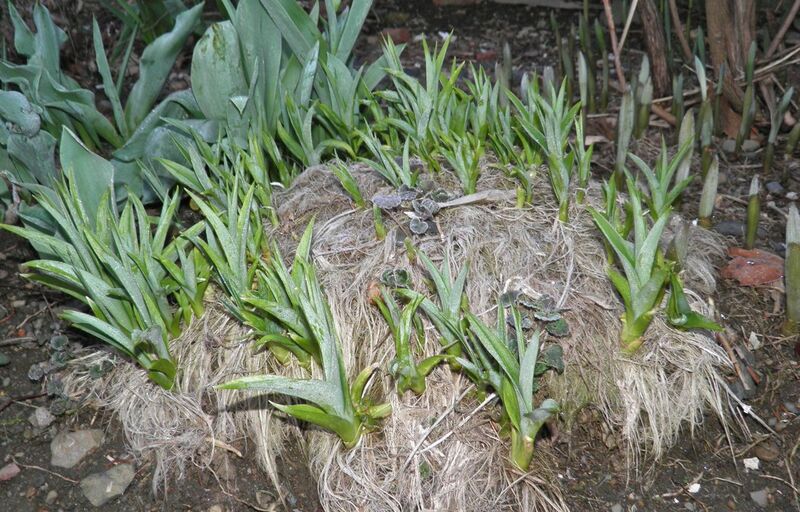 Lillium have roots that actually drag the bulb down to its proper depth. Weird, huh? Often as lillium mature and divide they can crowd each other out. 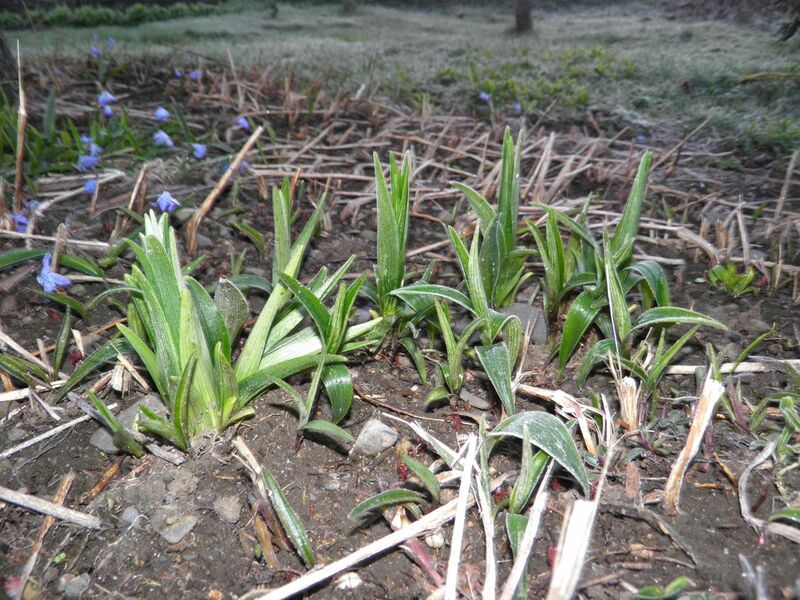 If you see you have a clump that may be a little tight you can move them in spring. probably stand to be re-spaced next year. Carefully dig a circle out a way from the sprouts. If you get too close you may slice down through a bulb. Divide the bulbs from each other. If possible, leave some dirt around each bulb as you do so. Replant and you’re done. If you want to transplant hemerocallis now is the time too. Actually, a couple weeks ago would have been better, but you can still do it now, or in the Fall if you would prefer. Day lilies can form dense mats quite quickly. If you dog up the clump you will see it’s composed of many, many separate rhizomes. Each one is capable of producing a day lily. When I divide I tend to replant them in bunches so there’s not a sad, lonely single lily standing by itself. They’re far more effective in clumps. 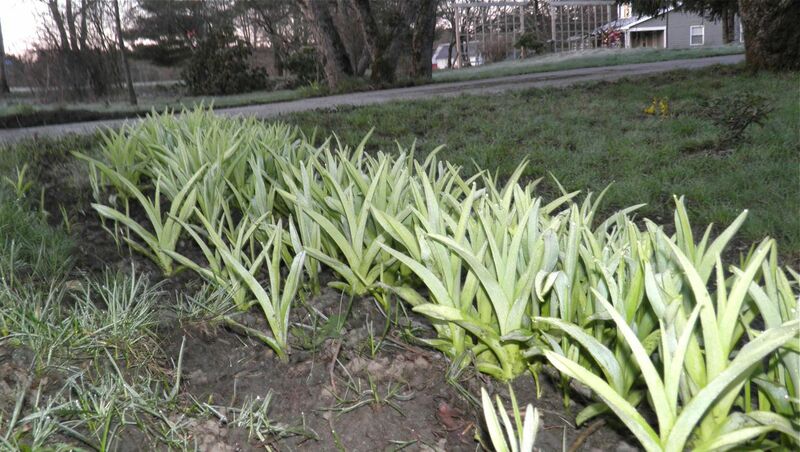 I’m working to have a row of day lilies the full way across the front of the property. It’s getting there. They are absolutely stunning when in bloom. The weather is supposed to be glorious here today. I would imagine I’ll be out mucking around in my lilies again. The Garden Centres are OPEN!